In light of Melania Trump’s rather awful fashion faux pas a couple of weeks ago, I thought I would delve into the world of slogan tops. Let’s face it, there are so many other statements she could have made that day. But I’m not one for politics so let’s talk fashion. 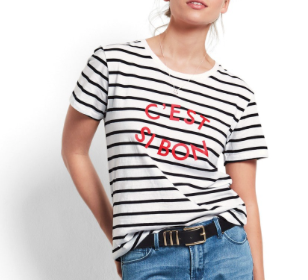 Slogan tops have been around for a while now and whether you want to make a full on feminist statement or simply a declaration of love, there is something for everyone. I particularly love the collaboration between Katherine Hamnett and Help Refugees which is available on ASOS. Not only is it reminiscent of a Wham t-shirt circa 1984 but the best thing is 100% of the profits help to raise funds and awareness for people caught up in the refugee crisis. Most of these tops are ones I currently own and these pictures show you how I wear them to hopefully inspire you. They are now nearly all in the sale. I have then showcased some other slogan tops depending on whether you want to go all out ‘look at me’ or just quietly whisper your arrival. I know it’s about 100 degrees out there but we also know that it can be short lived and we may be back in a sweater sometime soon. One of my favourite tops I ever spotted was in the kid’s department of Next last winter and it simply said ‘It’s Cool To Be Kind’. Something I try to teach my children on a daily basis. If there was more kindness in the world, I guarantee there would be more peace.